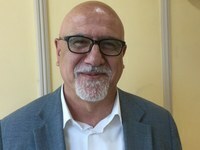 As a student back in the seventies, it took a while for Rifat Kassis to come to terms with being both a good Christian, and a Palestinian living under occupation. His call to become a reverend in the Lutheran Church in Palestine brought him to Germany to study theology 40 years ago. في مؤتمر تشاوري دولي بشأن السلام في 20 حزيران / يونيو، أصدر الائتلاف الوطني للمنظمات المسيحية في فلسطين خطابا مفتوحا إلى مجلس الكنائس العالمي والحركة المسكونية "لا توجد عدالة في أرضنا حتى الآن ". في الوقت الذي ينتظر فيه المسيحيون حلول ميلاد الطفل المقدس عند نهاية شهر ديسمبر/كانون الأول، يلعب فيه أطفال بيت لحم دورا محوريا لاسيما في التحضير لخطاب المعايدة لمجلس الكنائس العالمي (WCC) بمناسبة عيد المسيح لهذه السنة. As Christians worldwide await the arrival of the Holy Child in late December, children in Bethlehem have been playing a particular role in preparation of the WCC's Christmas message this year. How will Christmas 2016 be in the Middle East? Two Christians, one refugee mother in Lebanon and one pastor in Qamishli in northeast Syria, tell how difficult the message of Jesus’ birth becomes in times of war and unrest. The ecumenical dialogue between churches has a long and fruitful history. But since war and terrorism are threatening the existence of churches in the Middle East, Christians of this region feel more and more neglected by their Western partners. Father Emanuel Youkhana rues that, for the third Christmas in a row, the church bells will not ring in Mosul. He recounts that, around June 2014, the numerical religious minorities such as Yazidis and Christians around Iraq’s second biggest city began to face a horrific onslaught by the group calling itself IS (Islamic State), or Daesh in Arabic. Analyzing efforts to protect religious communities and groups and build peace in Syria and Iraq, the WCC and Norwegian Church Aid presented a joint study on protection needs of religious and ethnic minorities in Syria and Iraq. The findings were announced on 12 December to the media and public at the Palais des Nations in Geneva. As tragic news filtered out of at least three different countries this weekend, World Council of Churches general secretary Rev. Dr Olav Fykse Tveit called for an end to violence and corruption that stands in the way of a global just peace. 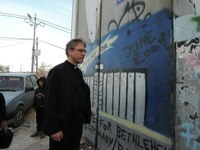 Speaking in Bethlehem on the evening of 8 December, World Council of Churches general secretary Rev. Dr Olav Fykse Tveit reflected on the light from the very first Christmas in the very same town, and what that light means in a global search for just peace. في خطوة غير مسبوقة ضد قيادة مجلس الكنائس العالمي والحركة المسكونية، اعتُقلت بالأمس الأمينة العامة المساعدة لمجلس الكنائس العالمي الأستاذة الدكتورة "إيزابيل أباوو فيري" وتم التحقيق معها ثم ترحيلها من مطار بن غوريون الدولي". WCC general secretary Rev. Dr Olav Fykse Tveit urged an immediate cessation of airstrikes and bombardments on Aleppo. 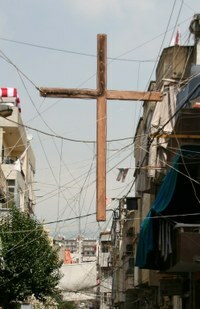 The conflict in Aleppo, Syria, has intensified in recent months, with hundreds of thousands of people fleeing the city. 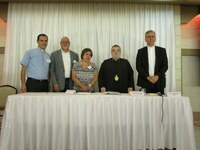 The story shared by Fr Yakoub Babawe of the Oum-El-Nour Relief Committee of the Syrian Orthodox Church in Iraq’s city of Erbil moved and challenged participants at a recent meeting in Beirut. The removal of the group calling itself Islamic State will not alone secure the return of displaced minority communities or their longer-term wellbeing in Iraq or Syria, a new report by The World Council of Churches (WCC) and Norwegian Church Aid (NCA) released today in Oslo has found. 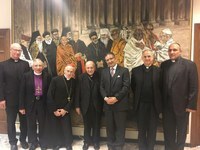 As Christians around the globe begin to commemorate 500 years of Reformation, a ceremony has been held in Vatican City in honor of Lutheran World Federation (LWF) president Bishop Munib Younan, from the Evangelical Luthern Church In Jordan and the Holy Land. The WCC is committed to a just peace in Palestine and Israel with a view that this conflict is about justice with deep moral dimensions that must be given proper weight by all if we are to reach a lasting solution. Religion can both contribute to the increase of the level of conflict, or help establish peace. Read the interview with the WCC general secretary Rev. Dr Olav Fykse Tveit. Prayers, advocacy and action need to continue so Israelis and Palestinians can exist side by side, and live in peace, wrote WCC general secretary Rev. Dr Olav Fykse Tveit in a letter to WCC member churches this week. وجه الامين العام لمجلس الكنائس العالمي القس الدكتور أولاف فيكسه تفايت رسالة إلى الكنائس الأعضاء في مجلس الكنائس العالمي هذا الاسبوع من أجل الحاجة المستمرة للعمل الصلاة والدعوة حتى يستطيع الإسرائيليون والفلسطينيون أن يتعايشا معا جنبا إلي جنب وأن يسود السلام بينهما.